She worked in a bank and was satisfied with her job and life. She was very happy and was shopping in the busy market when she felt a jab following a little pain and looked behind her and found two fierce looking men. They told her to follow them quietly and due to fear and confusion she did. They led her to a slightly less crowded area and told her that they poisoned her and in order to get an antidote she would have to help them in stealing a large sum of money from her bank. And they threatened her also to good measure about contacting police and informing anyone else about the same. They told her it was a special poison which would kill her in 3 days without an antidote and there was no other cure for it as well. She had no choice than to assist them, and she did as they asked her to do with her help they were able to steal more than 5 crore Rs. from the bank and told her that they would call her to give her the antidote later. She was fear stricken and half dead already but she hoped that they will honour their word. They didn't when she reached to the address they had messaged her she found it to be empty. Her time was up poison worked fine and she fell to the ground never to get up again. 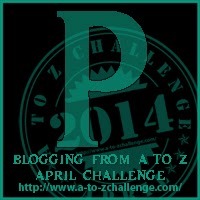 My Entry for Blogging from A to Z April Challenge 2014 - Letter P.